For those that didn't go to school and get a degree in working with children there may be help. For those of us that learn by experience, we have found that children don't come with a user's manual. Mom taught me to use common sense. What is common to one may be a foreign concept to another. Where do you turn for information on what is "right" for the playground? Children need different activities and events based on their abilities. Using broad age groups is a good direction to look, but the key is that the equipment should be in line with the children in terms of their size, ability and developmental level. This will certainly be hard to achieve with a large audience of potential attendees. Any group of more than ONE is certain to have different skill levels and a variety of needs. The CPSC in their Handbook for Playground Safety describes some specific items for different age groups. BROAD guidelines are used for a reason. This list isn't meant to be everything. Common sense, training and supervision go a long way to enhance the big picture. CHILDREN 2-5 The focus for this age group is social interaction; activities that make for great group fun, with just the right level of physical challenge. The 2-5 age group requires guard rails and barriers at much lower deck heights than older children. Deck heights for horizontal ladder launches may not be higher than 18", and the horizontal ladder itself cannot be higher than 60" above the surfacing. CHILDREN 5-12 Here our focus is more on physical challenge. Major muscle development is the source and inspiration for component and play equipment design. We've zeroed in on this group with challenging horizontal ladders, climbers and slides. Horizontal ladders may launch from decks up to 36" high and may be as high as 84" off the ground. Consider: Arch climbers, chain or cable walks, horizontal ladders, slides, swings, sliding poles. CHILDREN 2-12 Sometimes separate playgrounds for different age groups are not an option, so play structures must be created and designed to meet the needs of both age groups. To accommodate the needs of both age groups, both sets of guidelines must be met. It is best to limit use of the play structure to one age group at a time or, if not possible, you need to ensure that there is enough supervision to create a safe play environment for all the children. This age group tends to conflict with certain standards, so consult local, state or federal guidelines that may apply to your particular situation. The CPSC suggests that the layout of a playground should show distinctly separate areas for different age groups. What is ADA Compliance and why it is important for playgrounds? Playtime contributes greatly to a child’s physical, mental, emotional and social growth. Until recent years children with disabilities have missed out on this very important aspect of development due to inaccessible playgrounds. In 1992, the Americans with Disabilities Act (ADA) of 1990 became effective. This federal law prohibits disability-based discrimination by states, local governments and private entities (such as restaurants or child-care centers) that provide public accommodation. The law expands and helps clarify Section 504 of the Rehabilitation Act of 1973. It applies to new and existing play areas – meaning that you must bring all playgrounds into ADA compliance. Since guidelines for bringing playgrounds into compliance with the Americans with Disabilities Act (ADA) were issued in the year 2000, playgrounds have become more than swings and slides. Newly built and altered playgrounds are now accessible to children of all abilities. Designing a playground that provides an integrated play experience for children of all abilities is a real challenge. Involving users with disabilities is perhaps the most important step in creating a successful playground. It’s important to note that many amenities intended for users with disabilities will contribute to an overall improvement in safety and “user-friendly” design. Access to at least 50 percent of the elevated play components is required. Minimum requirements are based on the number and type of ground level components and elevated play components provided. Access to ground level components is required to at least one of each type provided and in a number proportionate to elevated play components provided. Ramps, shorter step heights, roomier decks, hand rails and grab bars can enrich the play experience for children of all ages and abilities. Playground features are designed to promote imaginative, inclusive and interactive play. An accessible playground means that it is as easy as possible for everyone to play, regardless of their abilities or disabilities. Now, more than ever, to meet ADA guidelines and due to community pressure, playgrounds are being built with an eye towards accessibility and usability. Our certified playground designers will be able to assist you with these and many other design requirements. I have a concrete pad (or asphalt) under my playground. What type of surfacing is allowed? Loose fill materials (wood, rubber, sand, gravel) must NOT be installed over concrete or asphalt. Concrete or asphalt surfaces require that you install rubber tiles, mats or poured in place surfacing in your use zone. While this is a much greater initial expense than loose fill products, it is easier to maintain the proper depth of surface. Once purchased and properly installed, compaction and decomposition are much slower. Many owners find this class of material easier to inspect and maintain. The 2008 revision to CPSC guidelines recommends against installing loose fill over hard surface unless there are additional layers of protection added. This is not allowed in some state licensed facilities. The addition of extra protection, wear pads and additional height of containment border add to the cost of loose fill to a price level around the same as unitary surfacing. Maintenance costs will be incurred from continuous efforts to keep the surfacing level proper, membrane barrier intact and safely in place, and drainage subsurface properly installed. Where do I put my playground? Well, where do you want it? The Consumer Product Safety Commission (CPSC) offers some advice in the Publication 325: Handbook for Playground Safety. 1. What is the travel pattern to and from the playground? Is there a door leading outdoors from your building or facility? Are there hazards in the way? Clear the hazards or pick a new location. What is a hazard? Crossing a parking lot or a remote location may be hazards. 2. What is nearby? Roads, traffic, lakes, ponds, streams, cliffs. This may mean a bi-directional concern. We don't want the children running off into the woods, into traffic, or into water. We also don't want those external issues joining a playground. Falling rock from placing equipment at the base of a cliff, stray vehicles out of control or flooding water may present danger to your children or your equipment. Building codes may address types of barriers that would be appropriate. A fence or hedge may define a perimeter but will do little to contain a car. 3. Sun Exposure: This is one that sometimes can be over the top. Pun intended. One state has guidelines that require licensed child care facilities to orient a slide so that it does not receive sun exposure. I can't figure out which part of the state this would be possible in, during daylight hours. Don't face the slide toward the west? If it is 100 degrees outside, does it matter what direction the slide faces? Consider natural shade from trees or buildings. Respect safety guidelines and distances. A tree may provide shade and may also provide a branch to climb or be struck by. Observe your site during various times of the day. Your buildings may offer shade in the morning or afternoon. A shade canopy may be part of your plan. They are available in many shapes and sizes to meet unique design needs. 4. Slope and Drainage: Some drainage is desired, but less than a two degree slope. You don't want materials to wash out. "A River Runs Through It" was a movie, not a playground. You may need some dirt-work to create a level playing area. If there are existing drainage patterns installation of a playground may change those plans. Placing your playground high on a high top might be a solution to drainage but creates problems in the travel pattern while running children fall going up or down a hill. 5. Accessibility: Do I need to meet ADA guidelines to allow access to the playground? Do I need a concrete walkway or crushed granite pathway to the playground? Children tromping through a grass or dirt field may have a negative impact on the carpet when they return from play. 6. Space: Do I have enough? The layout and pathways, even the landscaping should assist in identification of the route. Once on the playground distinct areas should be identified for each age group. How big is the equipment? Perhaps you have a piece of equipment in mind already, or a budget figure. Maybe you have a desired capacity for how many children you intend to be at play. If your goal suggests you need a certain space, you will have problems fitting the area into a smaller footprint. 7. Conflicting Activities: This goes along closely with space. As you create your design and layout, you don't want older children trampling younger children on their way to play. You don't want children running through the swing set to reach the slide. Moving equipment needs to go to the corner, side or edge of the layout. Slides exits should deposit the children in an uncongested area. Equipment selected will have specific use zone requirements. The slide you like may only be three feet wide, but needs fifteen feet of space. 8. Supervision: Can caregivers, parents or employees watch the children? If the playground forms a "L" shape around the corner of the building, it may be hard to watch children and monitor play activity. Are there shaded places available for parents or leaders. School principals have been surprised to find teachers huddled around the water fountain, at the building exit or under available shade. Plan for and encourage space, participation and involvement from adults. 9. Maintenance: Will the playground require replenishment of surfacing? Is there an accessible route for the initial installation and build? Can we get to the playground in the future? An interior courtyard may create a protected play area. When you have to run wheelbarrows of surfacing through the building you will remember next time. Consult a playground professional. Extra effort up front will achieve better results later. October 6, 2010 the Consumer Product Safety Commission (CPSC) issued a final interpretative rule on the term "Children' s Product." The Consumer Product Safety Improvement Act of 2008 (CPSIA) is found under Public Law 110-314. A "children's product" is defined as a consumer product designed or intended primarily for children 12 years of age or younger. Playground equipment certainly falls into this category, often being labeled for a specific age group such as 2-5 or 5-12. The CPSIA defines the maximum content allowed for heavy metal in coatings, phthalates and lead in substrates, 3rd party testing for certain products, and tracking labels. This legislation applies to imported as well as domestically manufactured product. With lead as a leading cause of concern under this law, it should be noted that many playground products are not "painted" but "powder coated." This lead free process exceeds the requirements under the law. Consumers should ensure what materials and process are utilized in the manufacture of their product. So the law covers everything? Not exactly. Actually, barely a fraction of the whole picture. While the CPSIA addresses several key and critical issues in safety, there are MANY other issues to address. The CPSC federal recommendations and the voluntary standards of the playground industry set forth by the American Society for Testing and Materials (ASTM) do not present exact and conclusive definitions and standards, either. There are certain areas which remain gray and professional judgment comes into play. The application of rules should also consider minimum standards and standard of care. One set of state rules suggests that there should be a minimum of 6-8" of playground surfacing installed beneath playgrounds. In the same publication and rules it is also stated that surfacing should be installed (at least in the case of Engineered Wood Fiber) to a depth of 12". Further reading will find that wood surfacing compacts after installation, and the suggestion of 9" compacted be applied. So, do I need: 6, 7, 8, 9 or 12" of surfacing on my playground? If I install 12" of wood surfacing, do I need to go out every week and replenish? If there is a fatal, life threatening or debilitating injury on the playground that had 6" of impact attenuating surfacing, would 12" have been a better standard of care? More information may be found in a previous blog: "What Federal Standards Apply to a Playground?" California (CA) appears to lead the pack in terms of legal compliance to safety. In the California Code of Regulations it is stated that playgrounds (public) shall comply with sections of the CPSC Handbook and the ASTM standards. After pages of should versus shall, recommend versus require: it comes down to basic steps. Design, inspection, materials used, assembly, installation, maintenance, training and supervision are specifically identified and called for. Some other states have specific references or applications of rules, but largely only applied to child care settings. In the playground industry, the International Playground Equipment Manufacturers Association (IPEMA) runs a 3rd party testing and certification program. Following every line to the letter and number won't make a difference if installation, operation and maintenance falls below standards. This means you may purchase top grade and quality product, yet fail at the simple standards due to error, neglect or omission. I hope we aren't done, yet. With gray areas, voluntary compliance and optional concepts, playground safety may get put on the back burner. The National Program for Playground Safety suggests that our overall US safety grade in their study was a C+. States which adopted CPSC guidelines received the higher grade of B, with states not adopting guidelines the lower grade of C was found. If my child's safety is involved, law or not- my child deserves a better standard of care. The old adage "you get what you pay for" certainly could be called for. Buying the cheapest, cutting a corner, neglecting management and maintenance of the playground or following minimum standards likely will not result in your being issued a citation by a police officer. Law or no law, don't cut corners with your children's safety. Consult a professional. In September 2010, President Obama announced a Stimulus Initiative that allows a business to expense 100 percent of a new equipment purchases through tax deduction. This full-value deduction can be taken while spreading out payments for the equipment over a longer term, such as a 60 month purchase. IRS Section #179 will allow for the deduction of up to $250,000 of business equipment. Credit and equipment restrictions apply. This program doesn't assume you are eligible for the depreciation schedule. Previous depreciation claimed may affect your ability to utilize the elections. Consult your tax advisor or accountant for additional information. Contact DunRite for more information about LEASING options and programs available. In tough times, individuals are the only that are pressed for a cash flow to make purchases. Our leasing team has programs for business and municipal entities that may help. Rather than make a lump sum purchase, stretch your purchase power by spreading over a longer term with our Municipal Leasing Program. With competitive rates, Fast turn-around time and hassle free documentation, this might be the solution to your equipment needs. Call us for more information! How is our WOOD SURFACING produced? Our wood surfacing is IPEMA certified. IPEMA is the International Playground Equipment Manufacturing Association. This is voluntary compliance, but requires strict adherence to standards. The reference standards for surfacing are developed and published by the American Society of Testing and Materials, as document F2075-04, Standard Specification for Engineered Wood Fiber for Use as a Playground Safety Surface Under and Around Playground Equipment. Compliance to this standard also requires compliance to F1292: Specification for Impact Attenuation of Surfacing Materials Within the Use Zone of Play Equipment. Testing of materials is rigid and conducted by Detroit Testing Laboratories. Inspection and follow up to equipment and process is maintained by IPEMA inspections of facility and product. 1. Materials must meet particle size requirements and tests, both wet and dry. This is achieved by a cutter to reduce sizes and a sieve to filter particles too small. Sieve, shaker, oven and balance test gauges and process are specified by ASTM C136, and meet F963 specifications. Our process is thereby TWO steps, ground and then filtered again. Most surfacing manufacturers only utilize a one step process, "cut." 2. Material must meet metal particle limits and concentrations, including hazardous metals and soluables such as mercury. This requirement is easily managed, as we do not utilize any recycled materials. We do not use pallets or post consumer materials. ONLY virgin hardwood materials are utilized. Antimony, Arsenic, Barium, Cadmium, Chromium , Lead and Selenium are commonly found in wood products, tests are conducted to ensure processing is below threshold. 3. A minimum on 8- one gallon samples are taken at random from a 50 cubic yard test lot to ensure adequate volume of material to tests. 4. Tramp and magnetic tests are conducted to ensure protection from embedded material. 5. Our facility is deliberate in the selection of materials that are processed. In addition to not accepting reclamation material, the product accepted is ONLY harvested hardwood. Our sources are known and documented. Pine, a highly acidic wood is NOT utilized, EVER. Sub grades of lumber are not acceptable to our milling process. 6. Materials are NOT stored for long periods of time. Materials have generally been cut within a 48 hours prior to delivery. This ensures fresh material free from contamination and premature deterioration. 7. Materials are transported in equipment specifically designated for this material. Vehicles are NOT shared with other products, to eliminate contamination. As this is not landscape grade material, vehicles are not utilized to carry manure, sand, dirt, gravel or recycled materials. There are about 6 pages of tiny 6 point font, double column specifications that are tested against by our testing laboratory. This is an expensive process, but a welcome and defining difference in an engineered and certified wood product. What Federal Standards Apply to a Playground? Are there really playground laws? Yes! While it is important that we follow the law, remember that our children are involved. We should also follow guidelines, recommendations, standards, best practice and COMMON SENSE. When our children are involved we have a privilege and responsibility to do our best to protect them. You should also consider reviewing ASTM Standards and CPSC Guidelines when reviewing playground planning, design, manufacture, construction, installation and operation. Inspection and maintenance become critical to ensure that your playground operates at the best possible level of safety. There is not an agency that travels about with a badge and represents themselves as "playground police." There are inspectors and specialists trained, educated and tested by a variety of sources. Consult your playground professional for information on best utilization of the available information. CPSC Publication 325 Handbook for Public Playground Safety . While this is not a standard or regulation it is an important GUIDELINE. More information is available from the United States Government Printing Office. State regulations may also apply to your playground! AR, CA, CT, FL, IL, MI, NJ, NY, NC, OH, OK, OR, RI, TN, TX, UT, VA have references in state documents that may apply to your situation. The simple answer, American Society for Testing and Materials , ASTM International, West Conshohochen, NJ. The ASTM is a 100 year old organization that has become a world known and recognized source for standards related to materials, products and systems. These are usually recognized by the authorities, specialists and experts within specific subject areas. There are over 12,000 standards listed in 77 volumes. This is light reading material for those not familiar with an industry. Your playground professional should be familiar with the context or usage of the standards, or may relay on a manufacturer to follow standards . For more information, visit them at http://www.astm.org/. ASTM F1487-07ae1 Standard Consumer Safety Performance Specification for Playground Equipment for Public Use: Purpose to provide safety and performance standards of public playground equipment and reduce life threatening and debilitating injuries. What are all those numbers? F1292 Specification for Impact Attenuation of Surfacing Materials Within the Use Zone of Playground Equipment: This specification specifies impact attenuation performance requirements for playground surfaces and surfacing materials and provides a means of determining impact attenuation performance using a test method that simulates the impact of a child ' s head with the surface. F1951 Specification for Determination of Accessibility of Surface Systems Under and Around Playground Equipment: This specification establishes minimum characteristics for those factors that determine accessibility. F2075 Specification for Engineered Wood Fiber for Use as Playground Safety Surface Under and Around Playground Equipment: Establishes minimum characteristics including size, consistency, purity and draining of wood fiber. F2223 Standard Guide for ASTM Standards on Playground Surfacing: Standards for selecting and specifying surface systems under and around playground equipment. This guide is to be used to assist the playground owner/operator, specifier, designer, etc., in determining the properties that can be considered with regard to the protective surfacing in the playground. F2373 Consumer Safety Performance Specification for Public Use Playground Equipment for Children 6 Months through 23 Months: This consumer safety performance specification provides safety and performance requirements for various types of public use play equipment such as, but not limited to, composite play structures, climbing structures, to-fro swings, spring rocking equipment, and slides. Recently our company was passed over for a major renovation project and another company was selected to manage a very LARGE project. When we inquired with one of the decision makers in the organization we learned that after looking at our website, the decision makers believed we didn't engage in the type of projects and scope of what they were looking for. They selected another organization who has a much smaller website, and in fact used the product manufacturer's website as their experience reference. In another situation, a customer came to us and asked for examples of a playground we would provide. Not a small task when we have 30,000 options! No size of equipment was provided, no budget. This customer made their decision based on random answers, and random offerings. In a third scenario we discovered a new playground at a facility. We didn't even know they were looking for a playground. Where did it come from? We immediately recognized the components, design and layout and identified that the equipment was imported from a foreign country. More about this in a moment. 1. Identify the decision makers. Who in your organization can represent the majority? Select members that will ask questions and provide input. You will also rely on this team to convey the decisions to the population of your group. A strong leader is important to keep the project on track and not derail after the first questions arise. Some individuals solicit input from children to find out what they like to do and how they interact with various types of equipment. 2. Identify the goals. What are your needs? You won't know you have found "IT" until you identify what you are looking for. Are you trying to fill a space 30' x 40'? Are you trying to provide play for 20 children? 3. Identify the target group. How many children, at what ages? Is there a variety of abilities and interests from the children? Did you see budget yet? While this is IMPORTANT, it isn't a concrete step. Certainly you may have a budget, but a plan is more important. Your PLAN may design a goal that won't be reached for 10 years. Many groups find out that commercial grade playgrounds cost considerably more than discount store equipment for a backyard. Do we wait until we have enough money and then go shopping? Certainly NOT! Utilize the experience of your playground professional to help and guide you through your process. Big trees don't get that way overnight. Good plans may require years of execution to achieve. Timeline may be important in your project. You may have a deadline. 4. Review product offerings from vendors. Use multiple sources. Don't make your judgment solely on who has the glossiest images in their catalog. The biggest or smallest catalogs may not adequately represent the abilities of the company. Your entire plan may in fact be found across several catalogs or sources. 5. Know who you are dealing with. Is this a manufacturer? Many manufacturers don't sell direct. Manufacturers often rely on dealers or distributors to represent their product. They may have exclusive or shared relationships. This adds another tier of investigation to your process. If your plan involves more than one product manufacturer you may be looking for more than ONE single company. Verify credentials of each. Will they work well together? How will they interface and come together to represent your interests and goals rather than their own? While on credentials, there is a significant issue our company has seen in the past few years. How long has the company been in business? What is their history? They may be around long enough to finish your project and collect your check. Will they be there to provide maintenance? Can they back up their warranty they offer? Where are they located? This doesn't mean to select the oldest company. This doesn't mean select the closest one to your new park. In yesterday's mail we received a beautiful 278 page catalog from a dealer. They are representing a foreign manufacturer. The writer has NOTHING against foreign manufactured products. Unfortunately the catalog is in metric measurement. There are some impressive credentials on the first pages. This is also the third USA based company representing this foreign manufacturer in three years. Involvement with multiple levels of this organization will require you speak several languages. A quick part or replacement will take weeks if not months. We've seen this before, simply put- those impressive credentials don't stack up. This particular company's experience in reaching standards for playground equipment in the USA simply hasn't been established or proven. WOW! And you may have thought to look for the best price! For every point raised in this article, there are probably a dozen more. YOUR children are involved! Go ahead and ask more questions. As a parent, I'd rather be safe than sorry. I wouldn't let your children play on the equipment if it wasn't good enough for my own children. Ethics and integrity should have been listed somewhere above. Again, this is for your children! Even playgrounds that are designed, installed and maintained in accordance with safety guidelines and standards can still present hazards to children in the absence of adequate supervision. Because all playgrounds present some challenge and because children can be expected to use equipment in unintended and unexpected ways, adult supervision is highly recommended. Not all playground equipment is appropriate for all children who may use the playground. Direct children to age-appropriate activities. Supervisors should be aware that the playground equipment is designed based on the most current version of ASTM standard F1487. The age-appropriateness of the equipment is also set based on this standard. The range of users encompassed by this consumer safety performance specification is the 5th percentile 2-year-old through the 95th percentile 12-year-old. It is important to recognize that preschool-age children require more attentive supervision on playground equipment than older children.Following these recommendations will help minimize accidents and injury to children while playing, but will not eliminate them entirely. Always remember that hazards can be eliminated - but risk can not. Checking for broken equipment and making sure children don’t play on it. Checking for and removing unsafe modifications, especially ropes tied to equipment before letting children play. Checking for properly maintained protective surfacing. Making sure children are wearing footwear. Watching and stopping dangerous horseplay, such as children throwing protective surface materials, jumping from heights, etc. Watching for and stopping children from wandering away from the play area. Not permitting the use of wet playground equipment. Wet equipment will not provide the necessary traction and gripping capability. Slips or falls may occur. Constantly observing play patterns to note possible hazardous play and overcrowding on playground equipment. Making sure children do not wear loose clothing, hoods,drawstrings or jewelry while on the playground equipment.These items could pose a strangulation/entanglement hazard. Checking to see that play surfaces are at an acceptable temperature before allowing children to play on them. What type maintenance is required for my play equipment? In your scheduled inspections you should document and take corrective action on all issues you observe. Inspections must be thorough, detailed and objective. Picking up litter is an on the spot activity, but you may find other problems that need parts or repair. Hazards may require that you take an activity or entire structure out of service until it is repaired. Repairs should be made in compliance to manufacturer recommendations. At some point in the life of the equipment you may need to assess the value of repair versus replacement. While it is often a greater expense to replace equipment, we can not place a value on the safety of our children. Surfacing should be checked regularly to ensure surfacing has not displaced significantly, particularly in areas of the playground most subject to displacement (heavy traffic areas). Displaced loose-fill surfacing should be raked back into proper place so that a constant depth is maintained throughout the playground area. Areas under swings and at slide exits. Activity in these areas tend to displace surfacing quickly. Rake loose-fill surfacing back in place. Pooling water on mulch surfacing. Wet mulch compacts faster then dry, fluffy mulch. If puddles are noticed regularly, consideraddressing drainage issues. Frozen surfacing. Most loose-fill surfacing that freezes solid no longer functions as protective surfacing. Even if the first few inchesare loose, the base layer may be frozen and the impact attenuation of the surfacing may be significantly reduced. This is NOT a complete safety evaluation of the playground equipment, such as risk of falls from equipment or moving impact incidents. Also, please be aware that playgrounds that are designed, installed and maintained in accordance with safety guidelines and standards can still present hazards to children in the absence of adequate supervision. An inspection and maintenance program is a requirement of playground ownership. Whether you have multiple large facilities with numerous equipment or one piece of equipment or fall somewhere in between, it is your responsibility as a playground owner/operator to inspect and maintain your equipment. Because the safety of playground equipment and its suitability for use depend on good inspection and maintenance,a comprehensive maintenance program for each playground must be developed and strictly followed. All playground areas and equipment should be inspected frequently for potential hazards, paying special attention to moving parts and other components which can be expected to wear. Inspections should be carried out in a systematic manner by trained personnel familiar with the playground area, such as maintenanceworkers, playground supervisors, etc. Inspections alone do not constitute a comprehensive maintenance program. Any damaged or worn parts, or any other hazards identified during inspection must be repaired or replaced before allowing children to use the playground equipment.Implementing an inspection and maintenance program is of the utmost importance and requires the full cooperation from the owner down to the playground supervisors. The importance of this program should be understood and supported by all members of administration,maintenance and the inspection staff as well as the playground supervisors. All information pertaining to the equipment should be kept on file(e.g., manufacturer of equipment, sales representative information, sales brochures, date of purchase, sales paperwork, shipping paperwork,drawings, bill of materials/packing list, installation instructions, date of installation, installer information, warranty information, etc. A record of any accident or injury reported to have occurred on the playground equipment should also be retained. ).The frequency of inspection and maintenance will be determined by several factors, such as the amount of use the equipment receives, theage of the children playing on the equipment, the age of the equipment and the area in which the equipment is installed. However, the more the equipment is inspected, the better the chances of finding and correcting any potential problems. A recorded inspection schedule should be adhered to and a copy signed and kept on file. New sites and equipment should be added to the inspection schedule. Training must be an ongoing commitment. The inspection report will serve as a report card against your audit and action plan. The audit will continue to play a major role in the inspection and maintenance program by measuring progress using statistics, actions taken and actions recommended.We recommend that you enlist the services of a Certified Playground Safety Inspector to assist you with auditing your equipment and developing an inspection and maintenance plan to suit your individual needs. He or she will also be able to assist in the development of short term plans as well as long term plans in response to equipment that is broken, damaged, missing, vandalized, worn, etc. 328 Soft Contained Play Equipment Safety Checklist (HTML) CPSC staff developed checks to help parents and children use Soft Contained Play Equipment safely. 5036 Prevent Burns on Hot Metal Playground Equipment (HTML) (PDF) Safety Alert. 5065 Strangulation Hazard with Playground Cargo Nets (HTML) (PDF) Safety Alert. 5094 Strings Can Strangle Children on Playground Equipment (HTML) Safety Alert. 5119 Never Put Children's Climbing Gyms On Hard Surfaces, Indoors Or Outdoors (HTML) (PDF) Safety Alert. 5121 Wear Bike Helmets On Bicycles - Not On Playgrounds (HTML) (PDF) Safety alert on a hidden hazard. 6005 CPSC Staff Recommendations for Identifying and Controlling Lead Paint on Public Playground Equipment (HTML) Executive Summary. Do I pay CASH for my Playground? Do I have to pay cash? Payment methods for playgrounds vary with the type of service, product or equipment. Large purchases may be a problem for cash flow in a small (or perhaps even a large) business. When planning your playground, consider your overall financial situation. Don't let money impact safety. It would be a better business decision to build a portion of an activity area than build something that doesn't meet appropriate safety considerations. Your design plan may include stages for present and future development. There are also numerous fund raising programs or finance and leasing options available to help match your playground to your business needs. Advantages to leasing your equipment. Leasing saves working capital: You can finance 100% of your equipment costs; there's no down payment. Leasing establishes additional credit lines: Your existing bank lines remain intact for other financial needs. Add-A-Lease lets you acquire additional equipment as you need it: Our lease grows with you, allowing you to add equipment to the original lease agreement. Leasing offers tax advantages: Your lease payments may be deductible as an operating expense. Check with your accountant. Leasing expands your budget: Leasing's affordable monthly payments can mean the difference between improvements now or waiting for future cash availability. Leasing is a hedge against inflation:Tomorrow's dollar may not have today's purchasing power, so it makes sense to use tomorrow's dollars to pay for today's new equipment. Leasing is available only for business entities. Has replacing and replenishing the wood mulch in your playground each year become a burden? Annual additions is not only expensive but also time consuming. Many playground owners don't replenish as often as they really should. This leaves a dangerous impact hazard for your children while refill is on the radar. There is an alternative to using traditional wood mulch. Long-lasting, durable RUBBER is the answer to this playground issue. Recycled rubber is available in a variety of beautiful colors. Since RUBBER mulch is only applied once to your playground, it will definitely save you both time and money. RUBBER PLAYGROUND MULCH is also an eco-friendly alternative for the millions of tires that are discarded each year in landfills. Often these landfills become breeding grounds for mosquitoes and dangerous diseases. Recycling these once useless tires into rubber mulch is a great benefit to the environment. 100% recycled tires that are non-biodegradable replaces the traditional wood mulch. You are not only choosing a quality product but you are also helping to keep our environment eco-friendly. DunRite offers a variety of rubber mulch colors and grades. Several beautiful, natural –looking colors are available to help customize your playground to your specific taste. Some of the colors to choose from are a milk chocolate Natural American, a deep dark Bark Brown, a traditional Rustic Redwood, and a natural looking Cypress. This product will stay vibrant throughout the years and will not fade like wood mulch due to sunlight exposure. Not only are there several color choices, but also there are a variety of rubber mulch grades depending on your specific product needs. Contact DunRite to determine the proper product. Remember that this is PLAYGROUND grade, not landscape grade. For those applications, we have appropriate materials to choose from! RUBBER MULCH will help protect your playground from unwanted insects, mildew, and fungus. Wood mulch also soaks up water, making it a target for mildew. Since RUBBER MULCH will not soak up water, it does not produce mildew instead it actually allows water to penetrate more quickly and drain away from your play areas. Wood mulch also has a tendency to breed “artillery” fungus which can often permanently things like your children and their clothes. RUBBER MULCH does not promote the breeding of fungus. RUBBER MULCH is definitely the answer to the many problems with traditional wood mulch. Our color warranty ensures that your rubber RUBBER MULCH color will last. Figure the annual replenishment costs, replenishment labor, freight and delivery charges, and the risk to safety- this quickly becomes the most cost effective solution! For more solutions and information, contact your PLAYGROUND Professionals at DunRite Playgrounds. There is not much doubt that recent generations seem to be in worse physical shape than their parents. Research points us toward an understanding that physical activity is good for our children. First Lady Michelle Obama has made fitness and childhood obesity a topic for our society to address with her Let's Move campaign. In a recent article in Playground News by Elisabeth Best, titled Public Schools: An Untapped Recreational Resource, we learn "Exercise can reduce gall stones and protect the hypothalamus, in addition to providing the more obvious benefits of improved cardiovascular health and an endorphin-elevated mood." Endorphins are produced in the pituitary gland during physical activity or exercise and are responsible in helping us to feel good and have a feeling of well-being. Unless we subject our children to acupuncture, a weight room, or a running track, there aren't a lot of other ways that are this easy to encourage this NATURAL, biochemical production and such good results. A visit to the playground with your children may even result in improvements to adult health! Don't mention to the children that they are going out for exercise, perhaps don't tell the children that running, jumping, playing and having fun are good for them. Let them have simple and pure fun. The U.S. Centers for Disease Control and Prevention reported in May 2010 that approximately one in five homes have a park, fitness or recreation center within a half-mile (Associated Press). The CDC issues concerns that one reason US children are overweight is that few have a nearby place to play and exercise. You will find the playground referenced as a one of the sources of children's health. Keep in mind the actual name of this government entity, the focus is on control and prevention! Of course, there is more to it, but it will be hard to argue that play is a valuable and life changing experience. As parents and adults, some of our best childhood memories are obtained from the playground. The playground experience is not only physical, but an emotional, social and cognitive experience. Voice of Play, an Outreach of the International Playground Equipment Manufacturers Association explains that "Free play encourages children to develop skills that build self-confidence and self-esteem, such as risk-taking, conflict resolution and imaginative dramatic play." Don't make play, recess and fun a historical note to teach our children about. Experience a new level of fitness. Engage in challenging activity for children, young and old. Without a proverbial crystal ball, this is a really tough question to answer honestly. Playground equipment is designed for use by an intended age group indicated by the design. With appropriate use, certainly longer than a product that is misused or abused. Our commercial playground equipment carries several different warranties. This will help with a partial answer. Galvanized steel posts, stainless steel hardware, aluminum fittings and aluminum post caps typically have a LIFETIME warranty. With proper care and maintenance, this is certainly a reasonable and reachable expectation. More about care in a moment. Punched decks, those coated, steel decks the children are standing on inside the play structure usually boast a 15 year warranty. Rails, rungs, loops, rotationally molded plastics and plastic sheet components have a typical 10 year warranty. Does this mean when the warranty ends, it breaks? NO!!! Warranty terms are usually determined by manufacturers by average and expected use. An elementary school with hundreds of children per hour is going to deliver much more rugged use than a private facility that may only be open one or two days a week. A child care center may experience constant and continuous play on the playground, but always under adult supervision. A community park may experience fewer children at play, but neighborhood hoodlums (not from your neighborhood, of course) may be a little too old to be horsing around on the equipment. Use, and the appropriate use at that- is one of the most important factors in the life of your equipment. Vandalism and misuse place a strong toll on your life expectancy and value. Imagine the disappointment of a city manager to learn his $3000 slide was cracked by the local skateboard enthusiasts experiencing the thrill of the huge skate ramp they found. What can I do to improve the life expectancy? Take your vitamins and exercise regularly. Well, that may help your life, but not necessarily that of your playground equipment. It starts with the planning and design. Ensure that you design is appropriate for the intended use, both capacity and age group. We have a line of equipment that is designed with larger diameter, steel posts, larger decks and larger tubes. This is appropriate for heavy use, large numbers, and offers a bold and impressive appearance. If you expect a lot of older children, such as at an elementary school, choose appropriate design features for older children. Two foot high slides for a ten year old are not much fun as a play event. They may also be more fun as a climbing ramp than a slide. Spring Rockers are fun for a five year old, but older children are going to cause greater wear and tear than intended. Installation is another key factor at the beginning of the life of your equipment. Professional installation requires strict adherence to manufacturer guidelines, measurements and methods. Improper installation may result in wear and tear in areas not expected by the design. Even with professional installation, the owner operator should be familiar with the components and the intended appearance and function. Regular inspection is also another important step in your playground management. So, I Need to be a Playground Mechanic? One community association installed cameras on the side of the nearby facility building with an aim over the playground. They didn't connect to anything, but did indeed serve as a good supervisor. One community association put the playground at the front of the community, where lots of people pass by and watch. (No, I'm not advocating placement on the thoroughfare, that is another topic). Another community association put the entire playground inside a compound, with gated entrance and ample PRIVATE signage. Another community association placed a sign that suggested children only play with adult supervision. They then sent letters to all community members instructing of the same. Guess which playgrounds are not only going to last longer, but likely be MUCH safer for the children at play? Other than your child's pediatrician, there isn't likely going to be a better supervisor than Mom or Dad. Encourage your adults to be part of the playground program. Install benches for parents. One community encourages family participation in the park by installing a gazebo, shade covered benches, picnic tables and a sand volleyball court. Something tells me one city manager would have been a lot happier if he had spent $3000 on site amenities and had a host of adults in the park, than having to appropriate an emergency replacement cost. Work with your playground professional to plan a WHOLE picture. Buying the "cheapest" piece of equipment may bite you in the back half. When our children's safety is involved, make sure YOU are involved and your playground will last longer, and be safe longer. Call or write us for more information, guidance or suggestions! Child obesity continues to increase at an alarming rate! Nationally, over 30% of children ages 6 to 11 years are overweight and 15% are considered obese. Overweight children face many health care concerns, including damage to growing bones and cartilage, Type 2 Diabetes and heart disease. All of this, coupled with a national trend of diminished playtime at school, our children are at risk. To combat child obesity, selecting a playground Fitness Course for your play environment is the right decision. A Fitness Course will stimulate children to test their strength, stamina, and coordination. Fitness equipment presents a challenge to children and will act as a prompt for competitive play. Fitness Courses will encourage more physical play than traditional playground equipment such as see saws, swings, and slides. 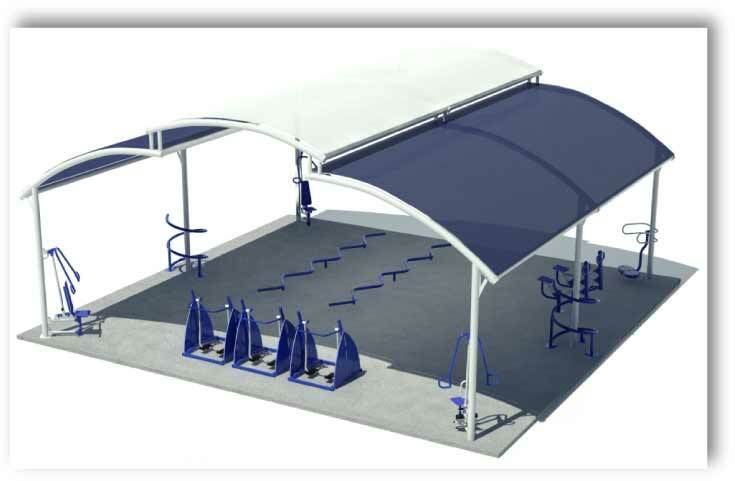 Fitness Course Equipment represents an excellent value as you will be able to purchase more individual products when compared to traditional play products such as a modular system. 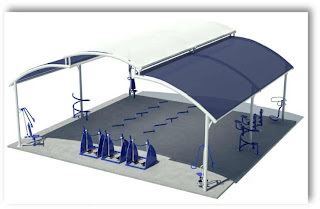 An important factor to consider is the space required for Fitness Course Equipment because each piece of equipment must maintain a 6' fall zone perimeter. Fitness Courses tend to be installed inline when space is not a consideration or in a circle when at a premium. Another method is to spread the course out over a larger area so that children can run from one event to the next further promoting physical activity. Adult Fitness Courses tend to employ this method of layout and one can find fitness stations near jogging paths on most public recreational sites. The American with Disabilities Act (ADA) began with a signing ceremony at the White House on July 26, 1990. The spirit of ADA is straight forward; to provide accessibility for people of all abilities. Applying these principals to the playground industry was a natural transition. The Architectural and Transportation Barriers Compliance Board (ADAAG), also known as the "Access Board," developed guidelines to apply the spirit of ADA to playground areas, both new and existing. Adapting playground activities to meet ADA guidelines can be quite challenging. The swinging sensation is very popular and desired by children of all abilities. Applying ADA guidelines to a swing was considered all but impossible! The swinging sensation is very popular and desired by children of all abilities. SportsPlay is proud to feature many different types of accessible swings that include a hammock swing and a molded swing that are shaped to hold children and adults in a supine position. A truly unique product is our Wheelchair Swing Platform that allows the entire wheelchair to swing. As such, the design of our swing platform eliminates the need for difficult wheelchair transition. Made of sturdy plastisol coated steel, the platform features two ramps for wheelchair access and egress. The platform is designed to allow the chair operator not only access to the platform, but also initiate the swing motion via a pull chain, if they are so inclined. The wheelchair swing platform mounts like a traditional swing via swing hangers and is suspended from the swing's top rail. 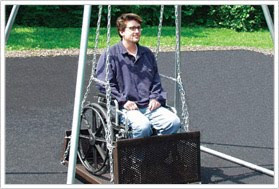 The wheelchair swing requires special consideration when placing the unit into the playground environment. Logic would dictate that the swing should be placed in an isolated area that would keep other children from crossing it's path when in motion. A common practice is to surround the unit with a barrier to keep others from crossing the swing's "to and fro" path. Another practice is to ensure the unit remains locked while not in use. DunRite Playgrounds is proud to offer a product that embodies the true spirit of ADA, allowing children of all abilities access to playground events. The playground Merry-Go-Round is a favorite of children around the world. 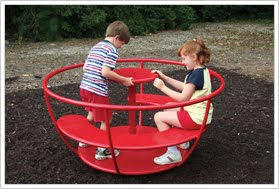 The merry-go-round stimulates cooperative play and creates the fun sensation children often equate with carnival rides. Since the advent of the Consumer Product Safety Commission Guidelines for Playground Safety, the merry-go-round has evolved over the years to incorporate safety and functionality. In the past, merry-go-rounds could be found in many sizes made from materials such as wood and steel. Today, one is more likely to find steel as the material of choice with sizes ranging from 6' to 10' in diameter. As part of the nation's movement to decrease playground related accidents, the merry-go-round has incorporated several basic standards to improve safety. When selecting a merry-go-round for your playground, ensure your product is no less than 9" above the surface. Additionally, the CPSC recommends that the speed of the merry-go-round not exceed 13 ft/sec. To limit excessive speed and to maintain the recommendation of CPSC guidelines, many manufacturers employee the use of a speed governor. The speed governor ensures the speed is restricted to within the recommended parameters. Handrails are also an important safety feature and will keep children from walking laterally while the unit is spinning and of course, provide a stationary post for grip. Unique to the market, our Tea Cup merry-go-round provides an amusement park ride for the playground environment. The Tea Cup also encourages children to sit down while the ride is in motion. The middle spinning disc promotes cooperative play and provides a physical challenge as children employ upper body muscles to set the unit in motion. Because of this design, the Tea Cup merry-go-round will usually ride slower than traditional merry-go-rounds. To ensure CPSC speed guidelines, the Tea Cup merry-go-round features a speed governor. The diameter of the merry-go-round will dictate the number of children it can accommodate. The 6' disc will allow 8 children, the 8' disc 12 children, and the 10' as many as 16 children. The use zone of the merry-go-round is calculated by adding 12' feet to the product's diameter. The use zone is the area that immediately surrounds the product that must remain free of objects. This zone is maintained as an additional safety measure and is recommended by the CPSC. Swings or swing sets are a popular play fixture found on most playgrounds throughout the world. Swings provide children with a fun-filled sensation as they glide to and fro on units made of steel or wood. In fact, swings have been around for many centuries and have been depicted in classical art throughout the ages. In early times, swings could be found hanging from tree limbs. Over the years, and with the formation of Consumer Product Safety Commission (CPSC) guidelines, swings have evolved with safety in mind. Safety guidelines dictate that the swings fall zone (area free from other objects) shall be 2 times the height of the top in front and behind the swing. Given this fact, a swings fall zone occupies a large area. When selecting your swing, keep this fact in mind. When selecting your swing, also consider the age of the child. The older the child, the higher the swing's top rail. The top rail height is measured from the ground to the cross bar that supports the swings. Also, as the age of the child increases, so too should the steel post diameter. 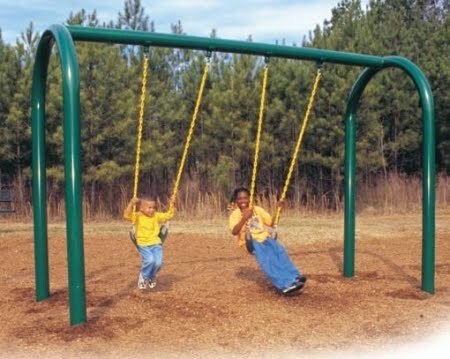 Older children (classified as 5-12) and adults are easily accommodated on swings that feature a top rail of 3.5" O.D. at a height of 10-12'. Additionally, the swing should employ three support legs (called a Tripod) rather than a Bipod. The Tripod configuration will provide greater support and less motion when used by older children and adults. A Bipod swing featuring a top rail measuring 2 3/8" O.D. with heights of 8' will accommodate younger children classified as 2-5 years of age. Single post swings provide a sleek look and are better suited for younger children. The swing fall zone is a very important consideration. Equally important is the location of the swing set in relation to the other structures in the play environment. The CPSC recommends that swings be placed away from other play activities. Such placement is encouraged to reduce the chance of children crossing the path of the swing's motion arch. Many accidents occur when a child crosses the path of a swing in motion. Calculating a swing fall zone is very easy. In the back and forth area (swing motion-front and behind) you must maintain a space that is 2 x the height of the top rail. If the top rail is 10' tall, the space required is 20' in front and 20' behind for a total of 40'. In the side-to-side area, you follow the standard requirement of 6' on either side of the swing. If the swing is 20' wide, you add 6' feet to each side for a total of 32'. The total fall zone for the swing used in this example is 40' x 32'. This total area must have a safety surface that meets the CPSC requirements for impact attenuation. 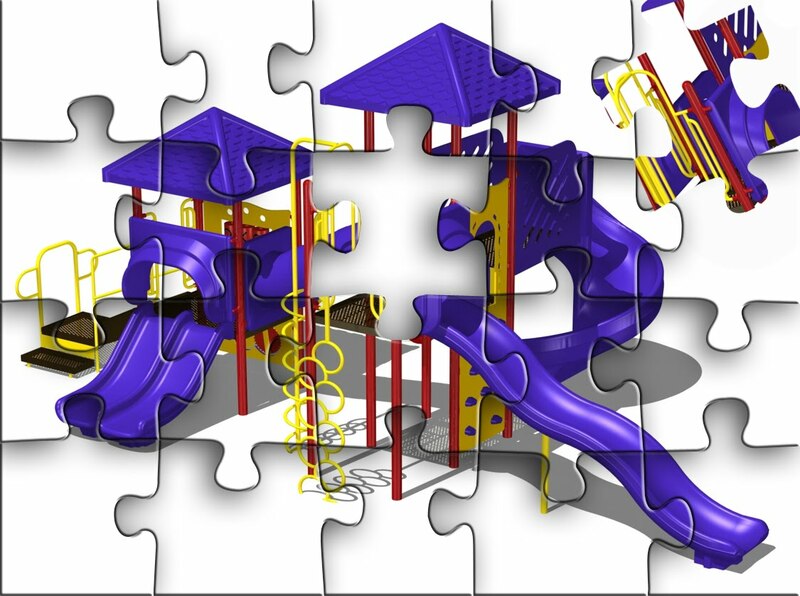 A term that is commonly used in today's playground market is "Modular" Play System. As the name implies, "Modular"play is a group of modules that fit together to form playgrounds of varies sizes, shapes, challenges, and accessibility. The Modular Playground System, or playground unit, is generally the centerpiece of the modern play ground environment. Found in parks, schools, day cares, and any location children play, the modern playground is quite different from the equipment manufactured before the early nineties. Older playgrounds were built with little consideration for accessibility, longevity, and in many cases, safety. Even today, one can find the rusted skeletal remains of these playground dinosaurs. The modern play system has evolved into a well presented, thoughtfully configured unit, featuring materials that are built to last while following strict guidelines to ensure safety, and meet the needs of the physically challenged. When selecting a playground unit, one must consider space, budget, and play components. Space is a very important consideration as this alone can dictate the size of the unit. The Consumer Product Safety Commission Guidelines for Playground Safety have determined that a six-foot fall zone must be established and maintained around the entire playground unit. Once you have established the size available for the unit, you can begin to lay out the structure. 2-D or Birdseye view drawings are very helpful in designing the playground unit. Using a series of geometric shapes, you can begin to see the unit take form. Typically, decks are represented as squares and the various play events are attached to each deck. Together, the deck, post and play event represents a module. You can continue to add modules together in any direction based on the space available at your play site. Once a 2-D drawing is composed, a 3-D rendering of the proposed unit can be generated. Through computer technology, you can see exactly what the playground will look like. The next important consideration is handicap accessibility. The U.S. Architectural and Transportation Barriers Compliance Board wrote a "Guide to ADA Accessibility Guidelines for Play Areas." The ADA guidelines dictate the ratio of ground level play events (play components accessible from ground level, i.e. a wheelchair) to elevated play events. The goal of ADA accessibility on a playground unit is to allow children of all abilities play opportunities so they will not feel left out of the play experience. When designing your playground, ensure you adhere to the ADA guidelines.